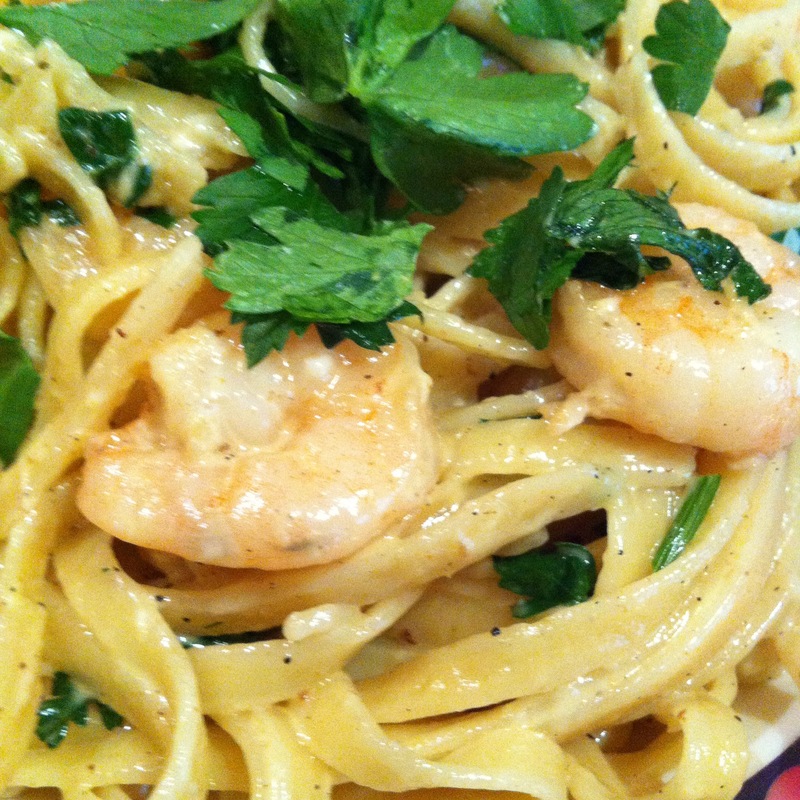 I made this recipe about a week ago *breaks out into the Shmoney dance* and used no cream. 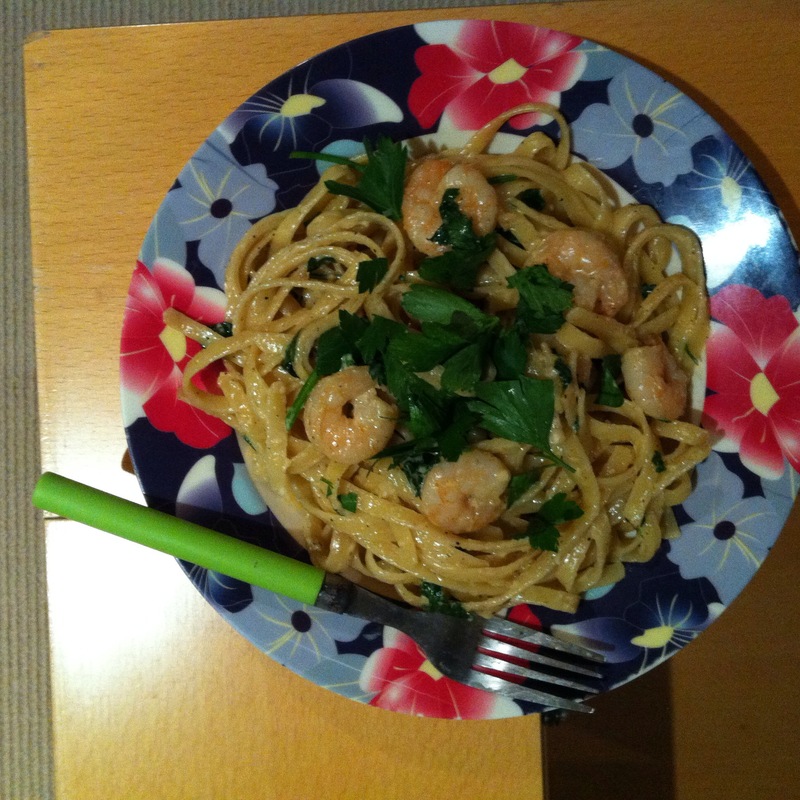 I didn’t have any at home so I went for a more olive oil based sauce inspired by Laura Vitale. It was really tasty! I made it a bit too spicy though, but didn’t use less chilli powder in tonight’s recipe because I knew that the addition of cream would counter the heat but still give me incredible flavour. Just like with the non-creamy variant of this fettucine, I kicked back and watched Frasier on my laptop (season 7 – so many Niles/Daphne feels!!) and waited to hear a review from my lil bro. 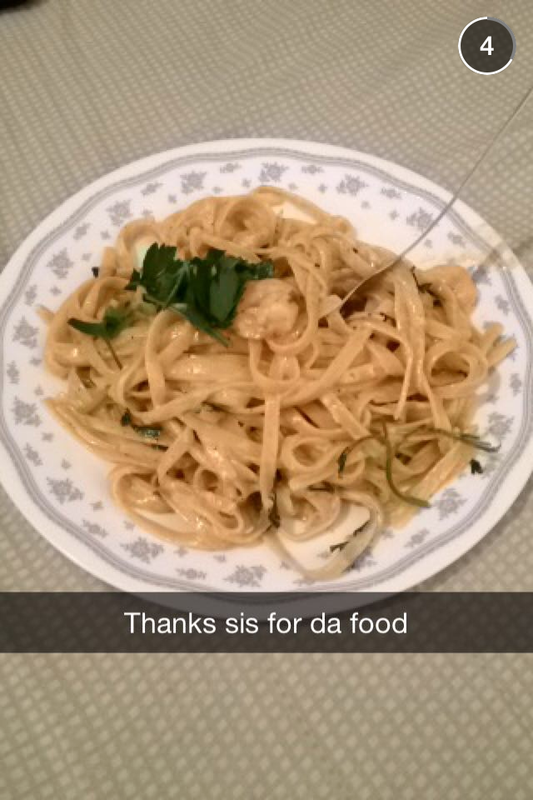 🙂 I screenshot his Snapchat of his dinner and included it here. Anan said he liked it and Ivan is still out so I will have to get his critique of this recipe later. I think Ivan will like the presentation of the plate I’ve left for him the fridge though haha. Cook the pasta according to packet instructions until al dente, and while that’s in the works wash and prepare the parsley, trimming off the stems. Place a pot on high heat and add olive oil and butter. Once the butter has melted toss in the prepared prawns and stir to coat in butter. Add the salt to taste at this stage. Add the ginger, garlic and chilli powder and continue stirring the prawns. Once they begin looking pink you can pour in the cream and continue stirring. 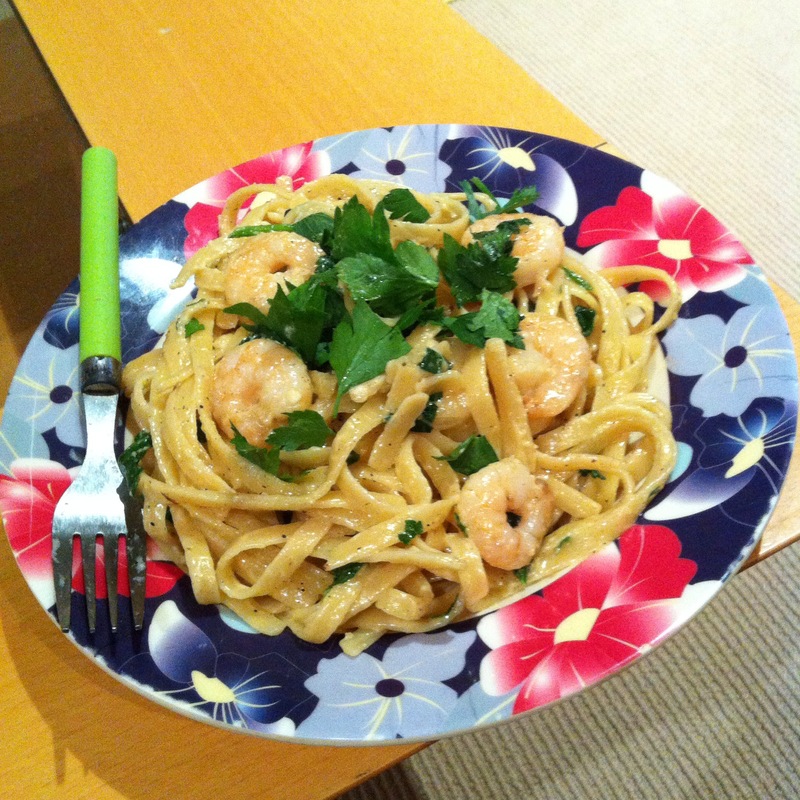 Prawns cook rather quickly! You can add in the starchy cooking water from the pasta now to thicken up the sauce if you desire, and also add your black pepper and chilli flakes. Taste and check if the salt, heat, and garlic is right. You shouldn’t worry about not tasting the ginger, it’s meant to be a hidden addition. Drain your pasta once it has cooked and then immediately toss into the creamy chilli garlic sauce and stir to coat all the pasta. Then finally add the chopped parsley and turn off the heat. Stir well to combine and serve! 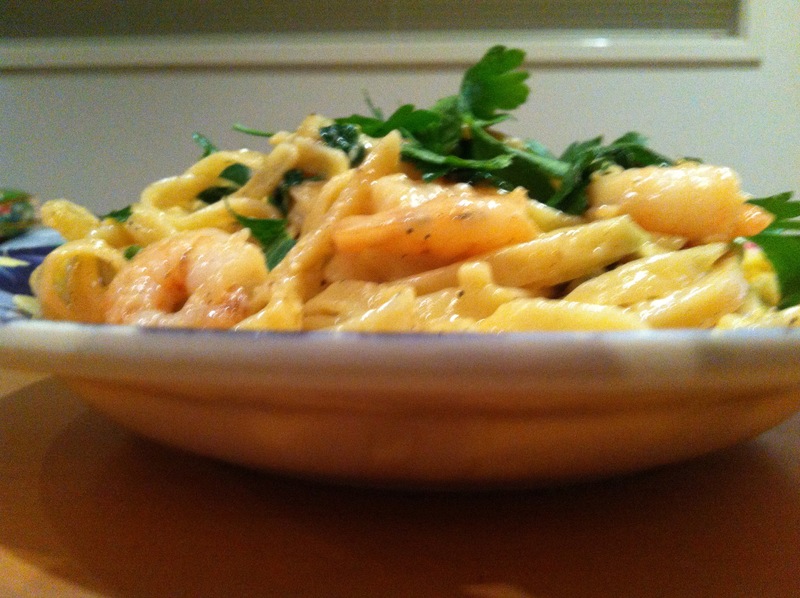 I used 21 prawns in this recipe and split all the pasta into three portions. I randomly prepared prawns and counted 21 later, which turned out to be perfect because I was able to equally divide the prawns with the pasta. Next Post Bangladesh 2015, Haul. Well this sounds incredible! I’ve literally just done a food shop but next time I will definitely buy ingredients to give this a go!